I find these colors above-average, especially for the price. I do think they are decently pigmented, apply easily, and I get a good amount of wear out of them, especially over a great primer (Too Faced's "Shadow Insurance," for instance). The colors come in nicely coordinated palettes, especially helpful for beginners. Of course, you know that you should keep the foam applicator only for emerge...read morencies and work with brushes for the best looks possible. I wish the packaging was as sturdy and lovely as it used to be, but the price is still right. Overall, these are a deal you can't afford to overlook! I bought the palette with 3 shadows, light green, greenish turquoise and orange. Each shadow indicates where it should go on your eyes, which is actually obvious to anyone who wears a lot of different shadow palettes like I do. But, for a beginner that's great. I have gotton so many compliments when I wear this trio, especially the light green as an under the brow highlighter. This is so reaso...read morenably priced at Walgreen's-$4.99. I have paid $36 for the Too Faced Summer palette. 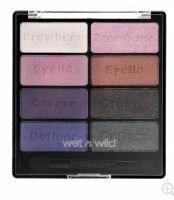 Actually, the colors and quality of this Wet N Wild trio are really good. They are highly pigmented, and I don't have to use a primer. The orange is so much better than the Too Faced orange. Wet N Wild's orange is a truer orange and really shows up; whereas the Too Faced orange takes several applications to show up. These colors are a great summer palette, especially since orange is the rage this season. I would highly recommend this line of shadows because they go on well with a sponge applicator (better than a brush in this case), colors are good, and the colors last all day. The how to instructions is a good idea, too. A lot went into this palette, and the price is incredible, especially for one who is used to paying high prices for prestige brands. Fair price, decent colors, and enough colors to play with. Wears farily nice.